Description This "three-string" vase (sanxian ping) can be categorized by its tall body, tapering in from the high shoulders to a round foot, a slender neck with slightly flared rim, and more notably by the three rings molded into the base of the neck. These rings emerge from the mottled pink and red peach bloom glaze which covers the surface. Sprays of green appear on the mouth and where the neck meets the shoulder. 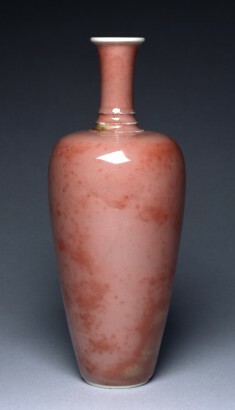 This spotting was achieved by blowing a copper-oxide glaze on to the vase and covering that with a clear glaze; when fired, the inconsistent spray of copper would create various shades of red or oxidize green. The finest of peach bloom wares date to the latter half of the Kangxi reign (1662-1722), produced at the Imperial kilns at Jingdezhen. The glaze's delicate modulation of color suited its application on sets of petite porcelains for the scholar's writing table, including small flower vases, brush washers, and boxes for seal paste. 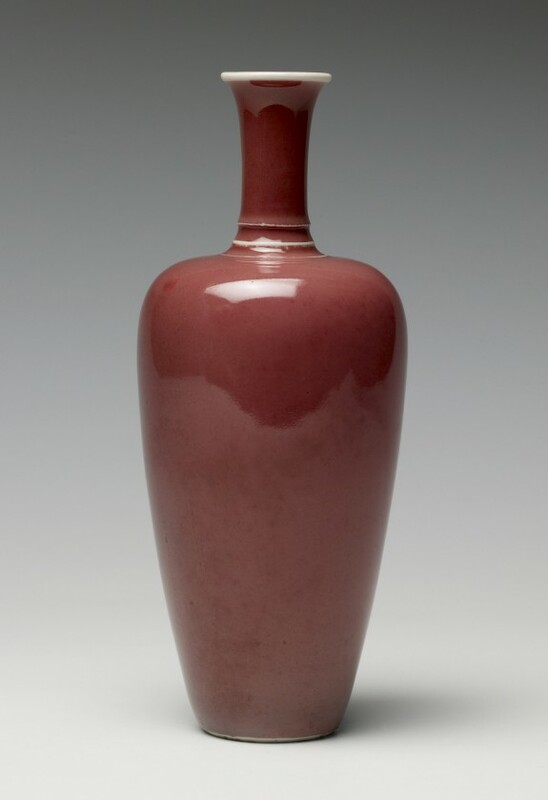 This vase is the sister to another infamous "three-string" vase in the collection (Walters 49.155), both purchased from the Morgan Auction sale in New York (1886). Provenance Mrs. Mary Morgan, New York; Mrs. Mary J. Morgan Sale, American Art Association, March 8, 1886, lot 342; purchased by William T. Walters, Baltimore, 1886; inherited by Henry Walters, Baltimore, 1894; by bequest to Walters Art Museum, 1931. H: 7 11/16 × Diam: 3 1/8 in. (19.6 × 8 cm); H on base: 9 13/16 × Diam: 3 1/4 in. (25 × 8.2 cm); Base H: 3 3/8 × Diam: 3 1/4 in. (8.6 × 8.2 cm).